During my student days, I made a cola and chocolate cake for a friends birthday. To make the cake aesthetically pleasing, I could have easily decorated it with those gummy zingy cola bottle sweets, but I chose not too as they contained animal gelatin. I can’t remember how the conversation started, but I was telling a colleague at work this and she advised that nowadays there are kosher and halal cola bottles and marshmallows. I appreciated my colleagues knowledge around this and her interest in my diet. She was right to point out that there are some products that are 'suitable for vegetarians and vegans' such as halal ‘Jellies’ that are either made with guar gum, caragheen or agar agar, but not all. Kosher essentially means suitable for Jewish people and Halal essentially means suitable for Muslims as the animal had been ‘sacrificed’ according to the rituals of that religion. The sweets she was referring to were still made from animal extracts, they just happened to be kosher or halal, but not necessarily suitable for a vegetarian or vegan diet. However, on the positive side things have changed for vegetarians and vegan who used to miss out on certain sweets associated to their childhood or aspects of comfort eating like hot chocolate with marshmallows on a cold day. Nowadays, you can now purchase vegan marshmallows, gummy bears, wine gums and even cola bottles, the only drawback for a small portion they are all of course a little more on the pricey side, but hey that is a price some of us choose to pay in the larger scheme of things. So why am I talking about cola bottles and marshmallows. Well, I carried out another baking experiment. I had some vegan marshmallows from Christmas that were approaching their use by date. 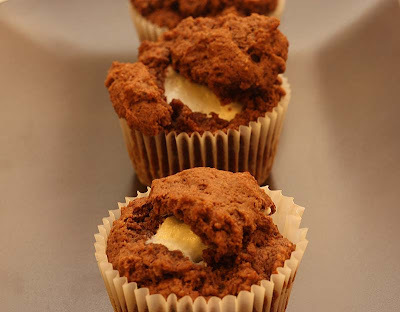 I had won a muffin cookbook early in the year which contained a recipe thats been calling out to me: Marshmallow, Cocoa and Cola muffins. I thought why not attempt making a vegan version of these. I am pleased to boast yet again, that they have been successful. This was the first time I had ever baked with marshmallows and replaced the egg with a vegan substitute of ground flax seeds. 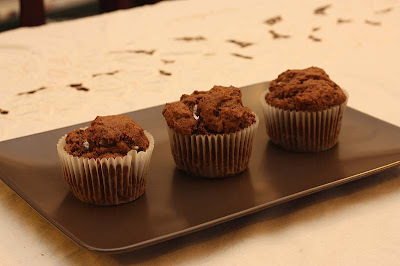 These muffins were absolutely delicious. The top was like a soft cookie, inside it was soft like a brownie but not overly sweet. The mallows held their shape really well and melted in the mouth. The only criticism I have and it is a very small criticism, neither D or me could taste the flavour of the cola in it at all. 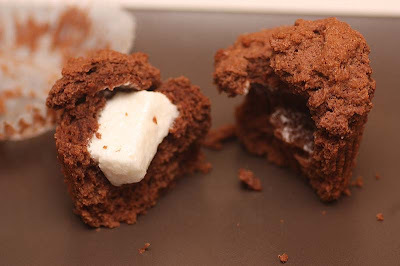 Vegan Marshmallow, Cocoa and Cola muffins. Preheat oven to gas mark 4. Line a muffin pan with muffin cups. Mix the flour, baking powder, salt, and sugar in a large bowl. In another bowl, mix together the ground flax seeds (or egg) and vegetable oil. Add the cola, then pour the cola mixture all at once into the dry ingredients and mix briefly until just combined. The mixture will thicken up here but don’t worry. Place a large spoonful of the batter into each muffin case and add a piece of marshmallows, keeping them in the middle of the muffin. Spoon the remaining batter on top, dividing it evenly. Bake in the oven for 20 – 25 minutes, or until well risen and firm to the touch. Serve warm or cold when it will have a brownie like texture. Recipe adapted from Catherine Atkinson’s Muffins Galore. We don’t partake in Valentine Days activities, but I think I may have to bat my lashes at D for another box of marshmallows, as my Birthday is a long, long way now. Or maybe I’ll try making my own. 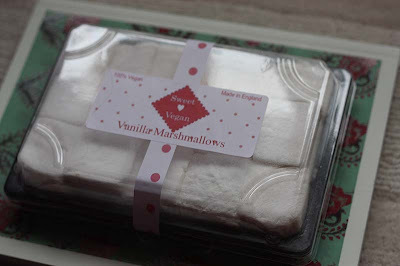 Oh if your new to my blog, you may be interested reading more about marshmallows and me. I know I promised to look up that marshmallow recipe for you - I just haven't found it yet. I'll have another look this weekend! I must say I have had great success with using flax seed as a egg substitute, glad it worked out for you too. I love your new blog headder! Just left you a Favourite Photograph Meme on my blog. I loveee the look of those muffins! I havent tried the vegan marshmallows because of the price, but planned to get some when I start my job and can afford them. I know excatly what you mean about the gelatine in sweets, I always check the ingrediets because there arent that many without gelatine in the supermarkets (why they need to put beef or pork in lollies I will never understand). p.s. Your new header looks great! I'm so glad you posted a comment on my blog, because now I've found yours as well. You look like you've been at it a lot longer than I have! I've got some marshmallows in the cupboard. This would be a good way to use them up. These look so good. I was very happy to see vegan marshmallows at my co-op grocer. You should definitely give making marshmallows a try. They are extremely easy and taste better (fresher, obviously) than store bought. I'll keep an eye at for them. Good luck! MMMMMM,...your special muffins look so tasty!! I am going to make a batch later today! Thanks! Those look mighty tempting, Mango! There's something so wonderfully wicked about marshmallow. keep going on with ur blog! I hope u follow and visit me. That okay. I'm patient. I have found one on the internet, but would appreciate a back up in case it does not work out! Beer cake with chocolate, now that is an interesting combo! I've never made marshmallows but I am looking forward to having a go soon. Wow, I am amazed that you've never eaten a marshmallow, it was part of my childhood. Thanks for the link I will check it out. I'm going to have a go at making some vegan marshmallows, failing that vegetarian ones. Can I ask where you get your flax seeds and what brand as the packet I bought, I thought was a little steep. And Thank you for the photograph Meme. Thank you Ribbit. I am pleased with it, but still thinking about it. I thought you would like these muffins! I agree the price is steep, that's how I ended up getting them as a gift for Christmas, its not an everyday purchase but a treat. I said this before and I am going to say it to you too. Whisper in Mikeys ears, afterall Valentines days is coming soon, and this would be a nice treat, don't you think?! Thank you for coming by Monica. It is appreciated. And Thank you sooooooo much for sharing Chandras wisdom on 'skeleton in sweets'. She is spot on :) I am sure my readers will love reading your contribution and pay a visit to your blog. Warm wishes. Thank you so much for coming by Jagruti and you kind comments. 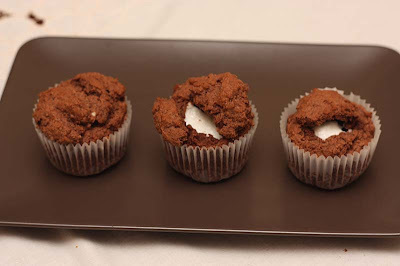 I hope you enjoy the cocoa and cola muffins. I will certainly come by and visit your blog. Once again Thank you. Were the vegan marshmallows at your co-op grocer reasonably priced? I will certainly be having a go at making my own very soon. 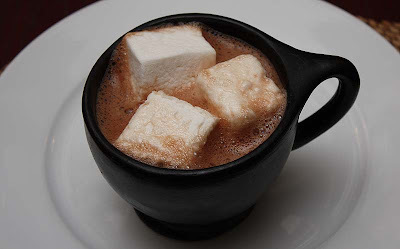 In the meantime, I am going to put a link to your site should some of my readers wish to follow your wonderful entry on making marshmallows. Thank you Sophie. I hope you enjoy them. Chard has become a firm favourite of mine and one I will grow for life. Thanks for coming by and your comment Tzoules. Mangocheeks my hubby usually picks up the linseed at Holland & Barretts when he pops into get other stuff, he says they are approx £2.99 for about 500g but he sometimes gets them on sale. When he does get them cheaper then he buys more packs. I have a co-op in my neighbourhood so I'll be checking them out for the vegan marshmallows, so thanks Krys for mentioning. Thats a good idea actually, I will demand I get some marshmallows for valentines day lol. Thanks for wishing me luck with the job, i think I will need it! I thought it was the linseed from H&B, but I was getting confused by the name flaxseed, and did not realise they were the same, although of course it looks it, so was looking for confirmation. Thanks. Just to forewarn youKella, Krys is in the USA, so she is referring to Co-op there, not in U.K, very unlikely you will find it in UK Coop. This sounds delicious and I love the vegan marshmallows! Yep linseed and flaxseed are one and the same, I plan to grow some in the fllower beds this year as they make pretty blue flowers. Sorry about the mix but I am more used to referring to it as linseed so it was a force of habit when I mentioned it again. Those muffins do look yummy! Thank Michele. So nice to hear from you. Thanks Kella. I am v. familiar with linseed as my mother used to give it to me and my siblings when we had a tummy ache when we were little. So I should be comfortable eusing it is cooking and baking. Thanks for confirming this for me. PS I've noted that packets of linseed are much cheaper in south Asian grocery stores. They were really lovely. Though we can import them, We don't have marshmallow mixes available in the U.K yet. One-day I am sure they will become available.